Villa Yeray is ideal for anyone not wanting to hire a car. The shops and restaurants along Playa Blanca Promenade overlooking the beautiful sandy beach are all within a 10 minute walk. Plus, from the promenade, you can also enjoy the 20 minute walk along the seafront to the fashionable Rubicon Marina. The villa has a fantastic spacious outside area and a private pool making it ideal for couples and small groups. Air conditioning/heating in the bedrooms and lounge, WiFi and pool heating are included. 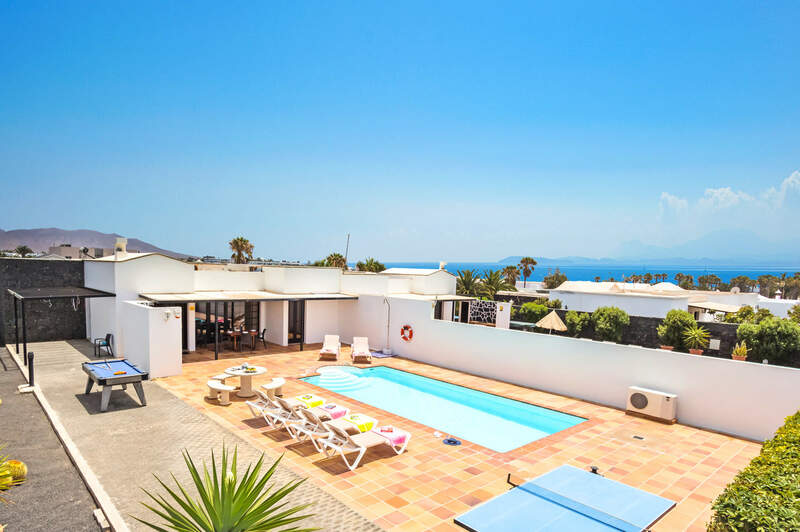 With a fantastic, spacious outside area and being walking distance from the resort centre, Villa Yeray is a hidden gem in Playa Blanca. Outside, the focal point is the swimming pool with Roman steps for easy access. The large terrace is ideal for soaking up the sunshine. Alternatively, you can take a relaxing break under the shaded pergola which houses a dining table and chairs. Next to it is the fantastic brick BBQ built in original lava stone adding some character to this area. There is also a built-in circular stone table and chairs which are great for making the most of alfresco dining. There is parking on the street and a large iron gate welcomes you into a surprisingly large terrace and pool area. Entrance is gained via the kitchen. The lounge is warmly decorated with patio doors leading out onto the terrace and pool area . There is comfortable seating, a small coffee table and a flat screen TV. Next to it is the dining area which thanks to the windows is flooded with natural light and houses a dining table and chairs. The well-equipped kitchen is adjacent and has a small table and chairs which are ideal for your morning tea. There are 3 bedrooms - 2 doubles and 1 twin - in total in this villa which all use the facilities of a separate bathroom and a shower room. One of the doubles has access to the pool area. All bedrooms are tastefully decorated. Villa Yeray is a semi-detached property with our Villa Iko located in a residential area. The centre of Playa Blanca is within walking distance with its shops, restaurants and bars. There is a pedestrianised street with rows of shops selling clothes, shoes and gifts as well as mini markets and a supermarket for daily essentials. The fashionable Rubicon Marina is 20 minutes' coastal walk from the centre. Plus, from Playa Blanca Harbour, you can even enjoy a day trip to Fuerteventura! In Playa Blanca Centre, there is a pedestrianised street with rows of shops selling clothes, shoes and gifts. There are mini markets and a supermarket for your daily essentials. Rubicon Marina is less than 10 minutes' drive from the villa with its chic designer shops, a French bakery and commercial centre. There is a market at Rubicon Marina every Saturday and Wednesday from around 09:00 to 13:00. Playa Blanca offers a range of restaurants including traditional tapas bars serving locally caught fresh fish, wines and cheeses from the island. There is also a good selection of bars, some reminiscent of home and some with live music and entertainment. There is a good choice of restaurants 10 minutes' walk away from Villa Yeray. The closest beach to Villa Yeray is Playa Blanca Beach in the resort centre, 10 minutes' walk away. Its central location means that there is no shortage of bars, cafes and restaurants as well as the other shops and amenities you might need, to make your sunbathing enjoyable. Or, in one direction the beach of Playa Dorada is less than 20 minutes on foot and in the opposite direction the beach of Playa Flamingo is 5 minutes further. Papagayo has pure, white, unspoilt beaches which are well worth a visit. Timanfaya National Park has the most amazing landscape with craters and volcanic lava. Why not try a camel ride here? Alternatively, the caves in the north of the island were formed when the lava flowed from the volcano, La Corona, down towards the sea. It has cooled down but the inside kept flowing so it created this underground tunnel which is just over 3 miles long and well worth a visit. Alternatively, visit Rancho Texas Park in Puerto del Carmen which provides entertainment for all ages. Throughout this beautiful island, you will find many examples of work by the famous artist Cesar Manrique. Plus, there are volcanoes, vineyards, spectacular rugged coastline and powder white sand beaches to be explored. Lanzarote is also a great destination for activities such as cycling, hiking, wind surfing, surfing, and water sports. Villa Yeray is not available to book for season as it is sold out. Take a look here at the Lanzarote villas that are currently on sale.